When you’re a green romantic and all efforts to make the world a better place seem like they’re failing, you start thinking it might all be pipe-dreamed: the self-sustainable, cruelty-free, organic, peaceful utopia. My boyfriend and I did. Until we came across this hillside town in Northern Israel, quietly perched between the Lebanon and the Sea of Galilee. As ethical vegans and frequent backpackers, we were hands-on familiar with environmentally conscious startup communities, but Amirim was different. Amirim was nearly 60 years old. We were scrolling through our vintage guidebook on a wild beach outside the Achhziv National Park, not even a 20-minute drive south of the locked-down Lebanese border, waving flies away from our faces and open blisters, when the graceful name of Amirim popped out at us. The entry was brief but peculiar enough: Amirim’s Hebrew name translates as “Tree Tops,” and its story began as a tranquil Zionist moshav—a type of agricultural settlement based on cooperation between individual farms—on a grassy hill overlooking the Sea of Galilee. Here, in the late 1950s, a group of vegetarian forerunners of various backgrounds found their respite from the frenzied, uncompassionate world. It got us wired for a thriving, bohemian, plant-based crowd, with a laid-back hippy vibe imbued sometime in the late ’60s, and presently home to fewer than a thousand people. The fact that our guidebook was already years outdated only fuelled our curiosity about current attitudes in the settlement. Our feet suddenly itching—not only because of the ooze from our blisters, probably incubating the flies’ eggs by now—we headed south to the seaside town of Nahariya. It was an early Friday afternoon, and we barely caught the last bus crossing east across Highway 85, which would pass Amirim. If we’d missed it, we’d have been out of luck: the rigor of Shabbat—the holy rest day in Judaism—would soon empty the roads and suspend public services until Saturday night. The bus’s onboard Wi-Fi was a blessing, but we soon brow-cocked and lip-pursed at the update on Amirim. Google brought up guesthouses and veggie-kosher feasts, which we interpreted as the presage of a beaten track and tourist-infested local experience. “Well, even if it’s crammed with pensioners, there sure is a lot of food at least,” I said, mustering up some optimism while we stepped off the air-conditioned bus onto the dusty, scorching Amirim Intersection. Reassured by Google Maps and with a new layer of sunblock, we hurried south towards Amirim, thrilled at the whole town of alternatives to our two weeks’ falafel-based sustenance. Twenty minutes later we trudged past the “Welcome to Amirim” board, but there was nobody to welcome us. Not even to throw a curious sun squint from a distance. Unexpectedly, the vegan feast we’d been taking for granted—no matter what remained of the forefathers’ utopian ideology—vanished into a mirage. Instead we shuffled up the hill past quirky ateliers, yoga studios, inns and eateries with suggestive eco-names worthy of top resorts, yet for some reason bolted up in the middle of high season in August. 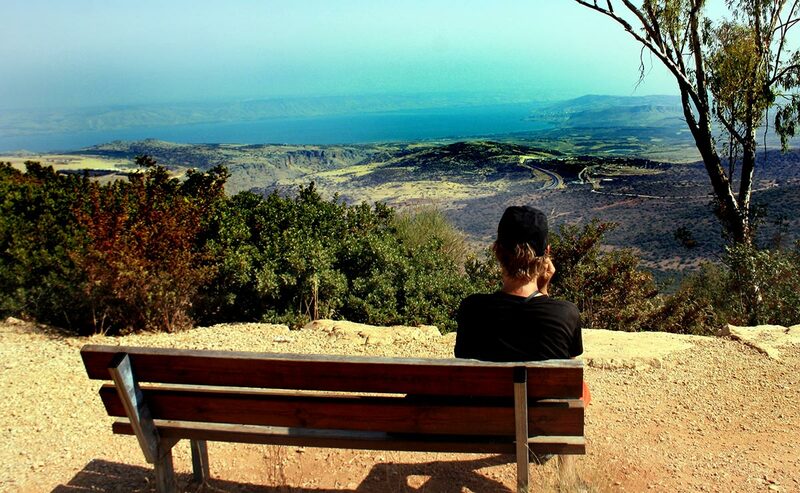 Looking out at the Sea of Galilee. It took us a decent amount of winding before we finally ran into an oasis-like bistro with a tiny garden waterfall churning in the background. 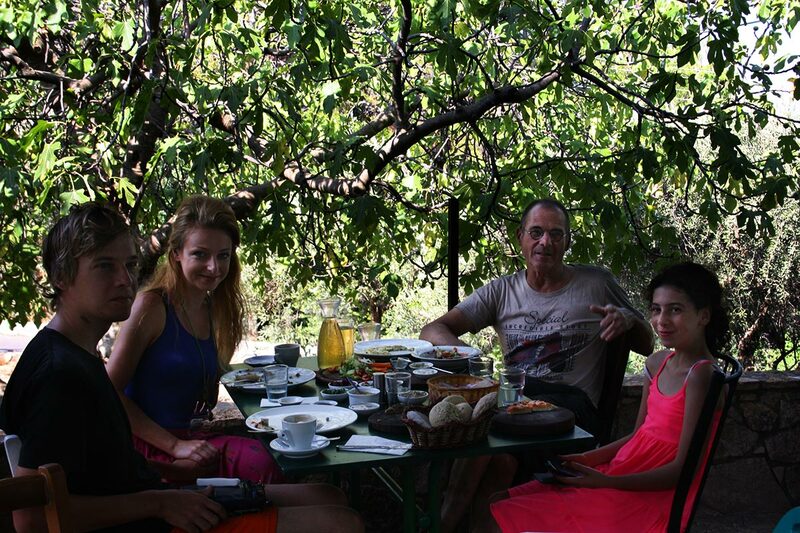 An elderly lady, the owner, settled us into a large table under a leafy canopy. The menu ran vegetarian options only, but our host kindly offered to prepare a vegan quickie: chickpea soup and avocado salad sided with her homemade bread. She is Swedish, a Zionist and an artist. 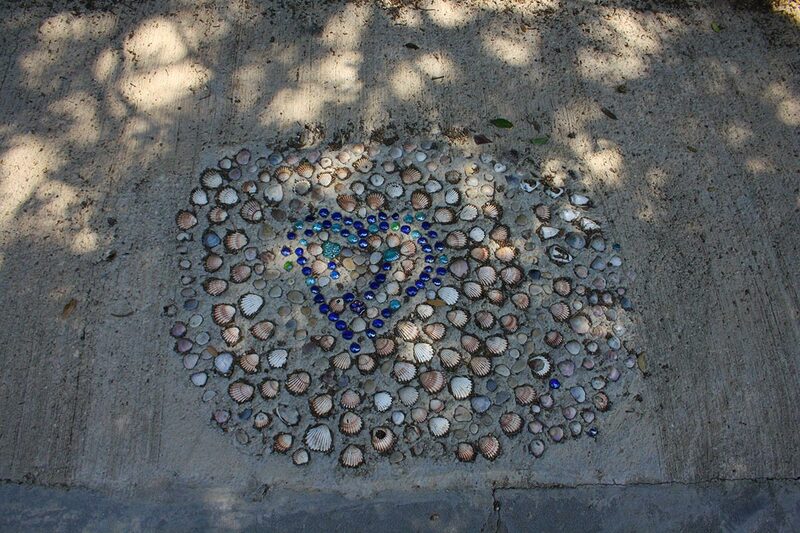 She has chosen the moshav for her retirement days and to host her personal art gallery. The latter is a compact house extension; the house supplies the bistro. An hour later, fed, caffeinated and familiar with our host’s and her friends’ multipurpose artwork, we were sent to a Friday-night concert on one of the most panoramic terraces of Israel “just round the corner.” We must see it, the lady said, and we yielded to that. 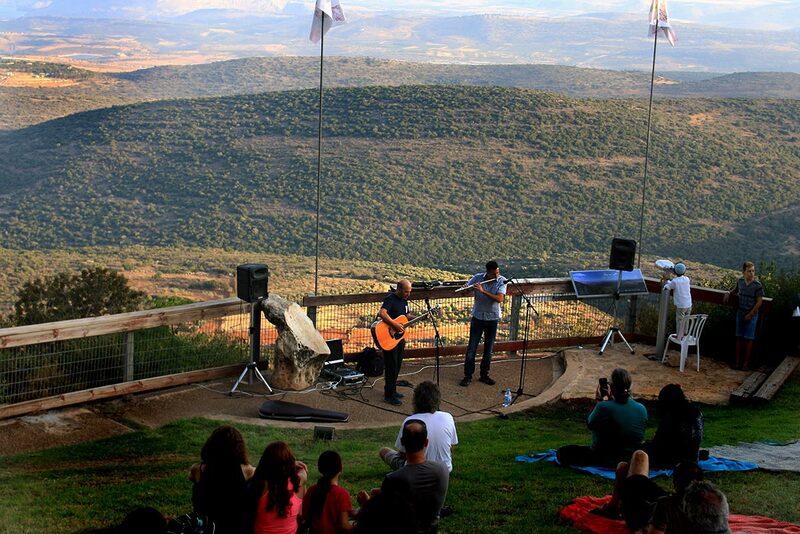 The terrace resembled the Roman theater, and the overall experience of the venue was sensually remarkable: energizing flute and guitar relaxed us by the rocky, moss-dappled hills; the biblical Sea of Galilee stretched out on the horizon, right behind the band. Quite a few villagers lounged on the warm ground, and more kept coming. Before we could even pick our potential host (the bistro owner warned us we might get into serious trouble for wild camping), we were approached by Rony and his energetic daughter, Seagal. Not a bad venue for an acoustic jam. Before even learning our names, the man eagerly offered us a sleepover at his place. There were already two other friends staying over, but their house was spacious. It was raw—he was still building it, all by himself—but comfortable. That night we cooked, dined and rested our strained backs on a thick mattress in a room with walls “coming soon,” as our host justified the open space. The unpolluted air felt bracing, and the view over the dark treetops dreamy. But before we fell asleep, Seagal played with my hair and Rony shared the odds and ends of life in a vegetarian moshav. The rules within the community are quite strict. It is forbidden to hurt animals or eat them; barbecues do not happen, ever. Eateries are not allowed to serve non-vegetarian meals, no exceptions. Rony admitted, however, that some meat gets “smuggled” into the moshav, especially since omnivorous spouses were introduced to the community. He explained that a lot of places closed up because Amirim’s tourism has been tumbling for some time. Yet the people here are sociable and like to meet up for a meal, and the few hubs they have are just enough. Friends from neighbouring settlements drop by daily, too. In the morning, Rony and his friends invited us to share their veg-Shabbat table laden with self-sustainable food. Every week, most of the community shows up at House 77, “the best restaurant in town.” Our focaccia and tofu fry-up were indeed exquisite—more than enough to compensate for our nearly lost hope for a falafel-free meal. House 77: the best restaurant in town. Outside the eatery is a fundraising stand. This is where you can meet the Crow Lover. Orit Baruch runs a natural healing practice and shares her home with crows. “It started when Rony brought a wounded baby crow he’d found on the ground,” she explained to us. The government told her to kill it, because state law classifies these smartest of all birds as pests. They are massively—and legally—killed or left impaired. Orit cared for this crow herself, naming him Oscar. Once he was healthy, he flew away and never came back. There are too many injured crows to care for, however, in Orit’s makeshift shelter. Not only is she hoping to raise enough money for an educational crow sanctuary, but she is also trying to influence environmental legislators. We watched her professional selfie video about the issue and her activism, then paid for a crow pin and became digital friends. 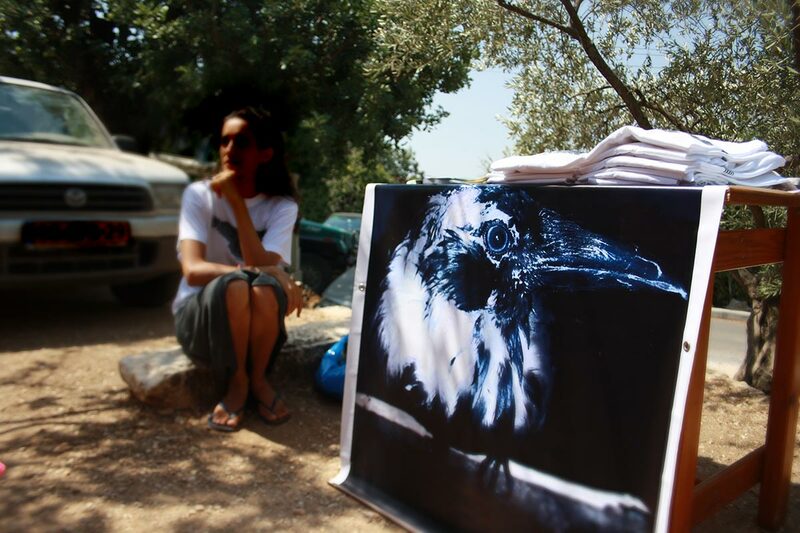 Meet Orit Baruch, Israel’s biggest crow activist. After nearly three hours of exchanging life plans, reasons and observations with the friendly villagers at House 77, it was hard to drop out of this intimately social event. With heavy hearts and stomachs, we aimed for the Sculptures Garden, an international art collection set amid aromatic nature and chirping acoustics. I immediately saw it as a magic forest with beings turned into stones. Forlorn and weedy paths, sculpture podiums, and sitting trunks add to the mood, shadowed and dreamy. We emptied a bag with our Shabbat leftovers and sipped down a lemonade bought from two little girls on our way up. Farther up the hill and past a homely synagogue is a viewpoint where two moods strangely clash and complement each other at the same time. If you sit on the bench, you smile at a sweeping golden backdrop for the biblical legends set at the Sea of Galilee. 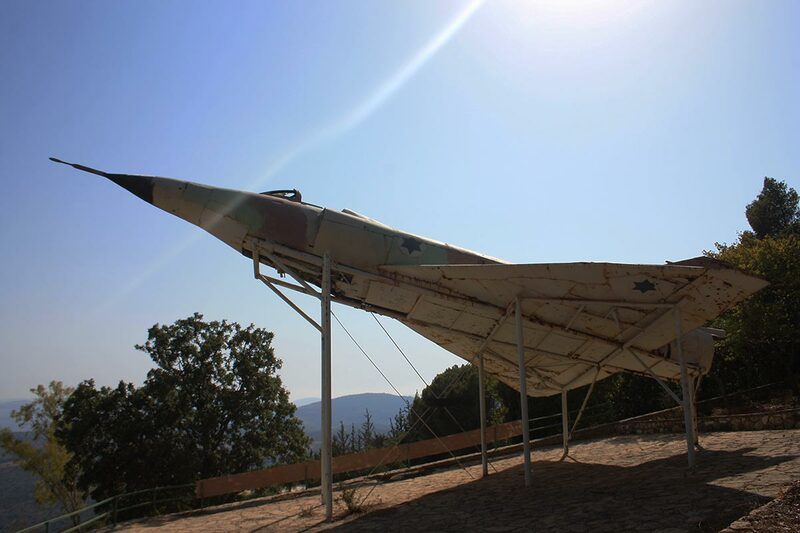 Crane your neck, though, and there is a warplane staring ahead—a memorial to Menachem Kashdan, a pilot from Amirim who lost his young life during the Yom Kippur War in 1973. A war memorial to a fallen soldier in Amirim. It is not easy to hit the steaming road again. “You don’t need to go anywhere,” Rony tried to persuade us. “You’re living your lives too fast. Spend more time on one thing. You’re missing out on things that surround you.” Seagal couldn’t let go of the blond hay on my head, soft tickling and tearful pulling. I’m not too assertive, and my companion almost never speaks. I lost a bunch of hair, and we stayed one more night. “I came here, and I couldn’t leave, it’s too special here,” the Swedish lady from the bistro told us on our first day while we were devouring her organic delicacies. How could she? It is a love-based utopia that has been happening for more than 50 years—a peaceful but thriving respite with an offbeat status reclaimed. A freelance writer and technical translator, Marta’s been on the road for four years, both solo and with her beloved archaeologist, Gunnar. She rarely skips her morning workout, and will always trek for days to the least spectacular venue as long as there is a story behind it. Delightful story. I want to be there, I felt like I was there and I am part of it. I want to be there, did I said it already? Thank you Marta. I am truly enchanted. Roni will be happy to host you….